In case you didn’t know, jicama is an edible root vegetable similar to a turnip. It originates in Mexico, and is often known as a Mexican turnip or Mexican yam. And although it looks like a yam, its texture is crunchy and sweet–just like a turnip. 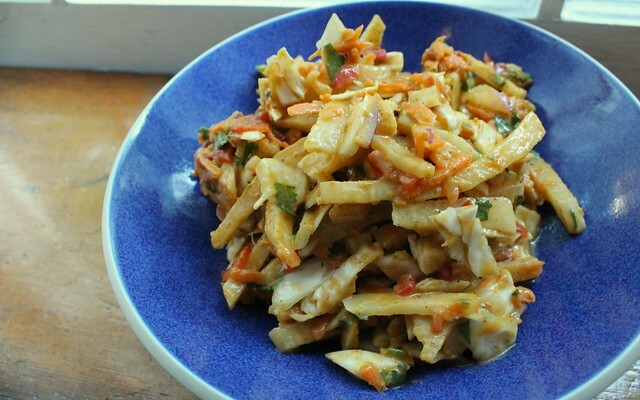 Immediately, I had the idea to take this crunchy veggie and incorporate it into a Mexican-style cole slaw. I had only really had jicama alongside my guacamole at high-end Mexican restaurants here in New York City. It was always a fun treat, and often had a bit of chili powder on the end to add an extra dash of spice. When it came time to make the salad dressing, I decided to take some chili powder and make something special. You won’t believe how great this avocado-verde salad dressing came out, and the secret ingredient behind it! When I made this, it was for a summer picnic where I fed a bunch of friends. To be honest, it actually makes a very big batch–but no worries! Trust me when I say that you’ll be enjoying it for a good, long while without any complaints. This fresh and crunchy take on the classic cole slaw gets some added flavor from Mexican root vegetable jicama and an avocado-verde salad dressing. To make the slaw, combine your shredded cabbage, chopped jicama, red onion, bell pepper, shredded carrot and minced cilantro in a large bowl. Mix well. To make the dressing, in a blender combine the salsa verde, avocado, olive oil, vinegar, salt and spices. Blend until the salad dressing is of the same consistency. Pour your salad dressing into the cole slaw mix, then stir well. Finally, serve. 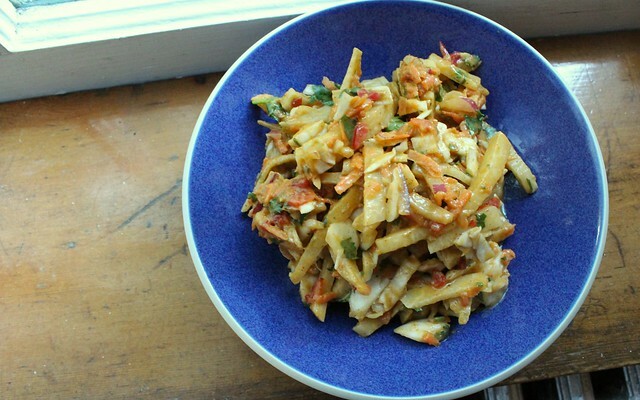 What have you made with Mexican vegetable, jicama? This entry was posted in Gluten-Free, Mexican, Salads, Vegan, Vegetables and tagged avocado, cole slaw, jicama, salad, salsa verde by Irina Gonzalez. Bookmark the permalink.